Ushigome Rimi is a first-year student at Hanasakigawa Girls' High School and the bassist of Poppin'Party. The other band members call her Rimi-rin. Outside of the band, Rimi is friends with Misaki, and similarly to Himari, one of Kaoru's fangirls. Rimi's pink bass guitar is a hand-me-down from her older sister Yuri, who is two years older than her and is the lead vocalist of the band Glitter Green. During Rimi's high-school entrance ceremony, she heard Kasumi's self-introduction that was filled with boundless optimism, and this sparked her interest in her. Though Rimi wanted to change her cowardly and shy personality, she had initially been unable to do anything about it. At first, Rimi declined Kasumi's invitation to become a member of the band Poppin'Party because of her stage fright, but everything changed when she became inspired by Kasumi who sang on stage at Live House Space until Glitter Green, who were late because of the weather, arrived. She eventually found her confidence to overcome her stage fright and managed to perform with Kasumi and Arisa. After the show, she finally decided to join Kasumi's band as its third member and bassist. Rimi is a shy and reserved girl who admires her older sister and often gushes over her. She tends to compare herself to the others frequently and wishes she could be more confident and be able to "speak up" more often. Rimi is cute and sweet-natured and often blushes when flustered, but at times can be very determined and strong as well. 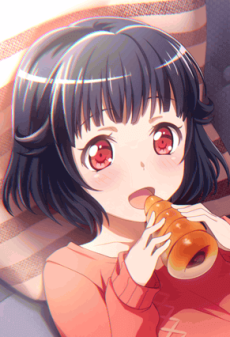 As Rimi used to live in the Kansai region, her Kansai dialect sometimes slips into her speech when she stumbles on her sentences or is very nervous; she is a bit embarrassed about​ this.